Welcome to the Science News page! Here you'll find all the latest updates from the world of Science, with links to sites where you can find out more. Is there something you think we have missed? Have you done something newsworthy in your Science lessons at school? Or taken on an interesting project at home? Let your teacher know if you've heard something interesting and would like to know more, or even better, write an article yourself and pass it on to Miss Smithson or Mr Jennings to be added to the page. Tim Peake set to return to space! British astronaut Tim Peake has revealed he will be heading back up to the International Space Station for another mission. 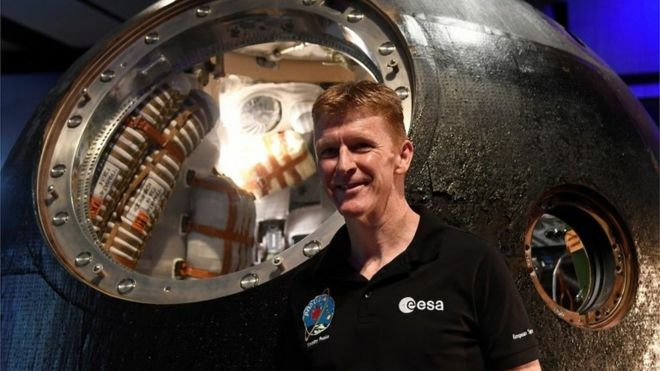 Last year he became the first British person to live on the ISS, when he spent six months on board carrying out experiments. Our very own Elder and Silver Birch Classes (now Hawthorn and Maple) supported his reseach by carrying out the 'Rocket Science' investigation here at Greenhill. Speaking at London's Science Museum this morning, Major Peake announced he will be taking on a second Eurpoean Space Agency (ESA) mission in the future. The timing has yet to be decided, but his second space mission would likely happen somewhere within 2019-2024. Their brains might smaller than the head of pin but scientists have discovered that ants can use the sun and their memory to work out how to get home. It's believed ants can work how to go in the right direction by looking at where the sun is in the sky and remembering their surroundings. Ants can lift 20 times their own body weight and when foraging for food they travel up to 200m away from their home which is called a colony. 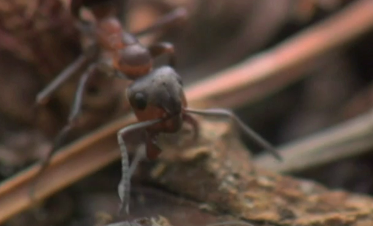 Researchers now hope to make mini robots that can find their way around like ants do. 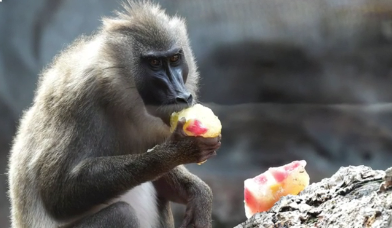 The results of a study into the grunts baboons make has found they create five sounds similar to the vowels we use to say words. It was thought baboons did not have the throat muscles needed to make vowel sounds. But after scientists analyzed more than 1,300 sounds made by 15 Guinea baboons they realised that sounds similar to vowels a,e,i,o,u were found in their voice, whether mating calls, grunts, barks, or even yaks. The research points to some monkeys having the physical ability for language for millions of years. It's hoped that these findings will reveal more about how human language began and developed. A baby elephant in Thailand who lost part of her leg in a trap, has learnt to walk again, with the help of a special swimming pool. The five month year-old calf, called Clear Sky, got her leg caught in an animal trap laid by villagers to protect their crops. She's is the first elephant to get this kind of water therapy. Baby elephants usually love water but she was a little nervous going in. Her vet has said that she's already showing signs of improvement. 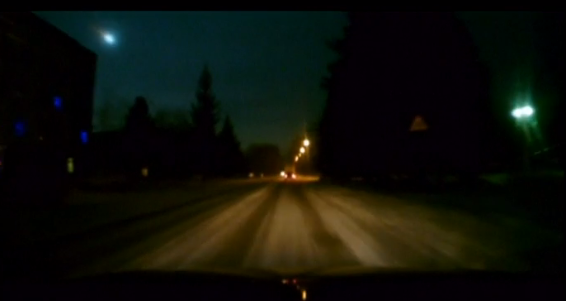 People in Russia have been treated to the spectacle of a huge fireball as a meteor shot across the night sky. The sight of the meteor was accompanied by a loud bang, which experts think may have been the meteor exploding. After travelling approximately 2.8 billion kilometers a satellite named Juno has finally reached Jupiter and is now orbiting the planet. It took about 5 years for Juno to reach it's destination. It's part of a special mission to find out more about the biggest planet in our solar system. During it's time in orbit, Juno will gather lots of information about Jupiter which it will then relay back to NASA. 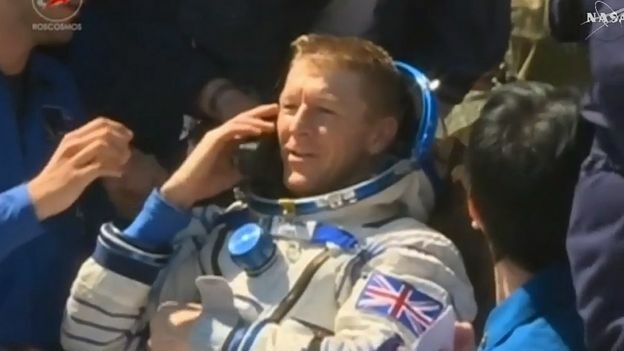 After six months in space, British astronaut Tim Peake has landed safely back on Earth. He said his journey was, "The best ride I've been on ever. Truly amazing. A life-changing experienced." When asked what it was like to be back on Earth he commented, "The Earth smells really strong!" Quite a change to what he is used to! To find out more, follow the link to see much more information and plenty of pictures. Scientists have created a way of turning urine, or pee, into power. A tiny battery costing as little as a £1 can make electricity from urine. The technology could be helpful for people living in poor and remote areas - creating a clean and renewable way of generating power. It was developed by researchers at the University of Bath, Queen Mary University of London and the Bristol Bioenergy Centre. Sunshine and Sweetie in Edinburgh Zoo, are the UK's only giant pandas. Now they are taking part in a special smelly project! The pandas are having their poo collected and investigated as part of a project to understand more about the animals' eating habits. Researchers from the zoo are also collecting poo from pandas around the world. They want to extract DNA from the poo, and try to trace the different foods pandas eat. This research will give zoos around the world better information on the best things to feed pandas, and could even help to breed new pandas! It's a smelly business but someone's gotta do it! Pollinating Insects Need Our Help! Pollinating insects are those that travel from flower to flower, spreading pollen, which helps the plants reproduce (make more plants). They're an incredibly important part of our world, as without them we wouldn't have a lot of the fruits and flowers we are familiar with. Their numbers are falling around the world but there's a new project that you can get involved with to help them. Click the link below to watch a video to find out more, and talk to your teacher, Mrs Powell or Mrs Horan if you're interested in making a difference yourself. Can you imagine if the temperature decided whether you were born a girl or a boy? Well that's exactly what happens with turtles. But experts in Australia are now worried that rising temperatures over time could cause chaos for turtle populations by creating too many female turtles. 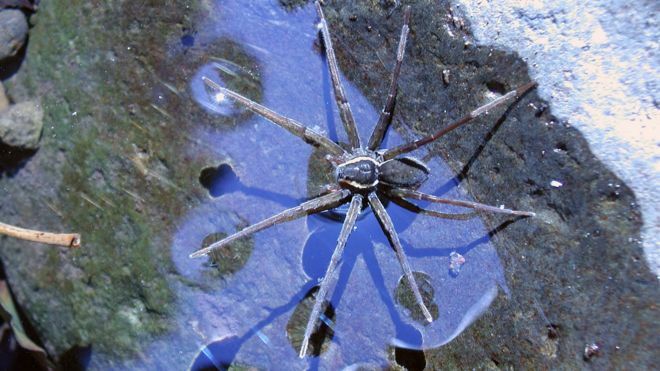 Australia's most newly-discovered spider surfs, swims and can catch prey up to three times its own size. The eight-legged insect was revealed at the World Science Festival in Australia, and was given the name 'Brian', after a famous scientist called Professor Brian Greene. The spider can be found in Queensland, Australia, and eats fish, frogs, tadpoles, and even big cane toads, but luckily isn't dangerous to humans. Brian catches its prey by sitting on the surface of water, and feeling vibrations caused by the creatures it wants to hunt. When it feels a vibration, it runs across the water to grab its prey. It then dives under the water with it, before swimming back to shore to eat it up. The US astronaut Scott Kelly and Russian cosmonaut Mikhail Kornienko have returned to Earth after spending almost a year in space on board the International Space Station. Being in space weakens your muscles so the pair needed to be helped from their capsule after it landed at around 4.30am this morning. Their 340-day mission aboard the International Space Station was twice the length of a normal stay. Now that they're back home they'll take part in studies to learn about the effects of spaceflight on the body. American space agency Nasa says the research will help them prepare to one day send humans to Mars. 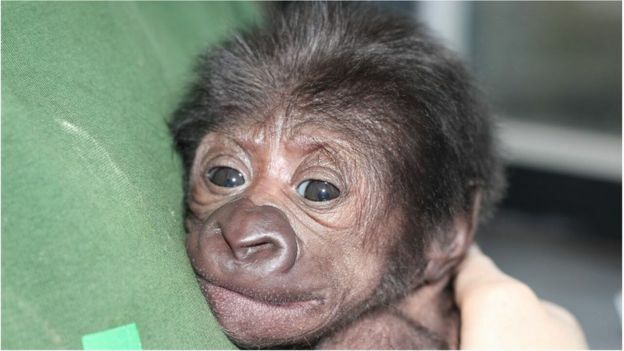 A baby gorilla has been born at Bristol Zoo following a rare operation carried out by a doctor who normally delivers human babies. 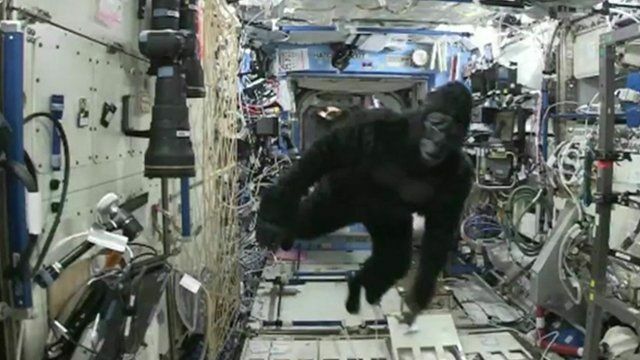 Monkey Business on the ISS! What's going on on the International Space Station!? Look's like Tim Peake is getting chased by a gorilla! Children across Britain linked up with Tim Peake on the International Space Station yesterday for a big question and answer session. The British astronaut has been up there for six weeks, but took time out to speak to children and share some experiments. After a flood damaged the few power cables in Nuevo Saposoa, a remote village in Peru, villagers were left without any electricity supply. They were forced to use kerosene lamps which were expensive and dangerous. 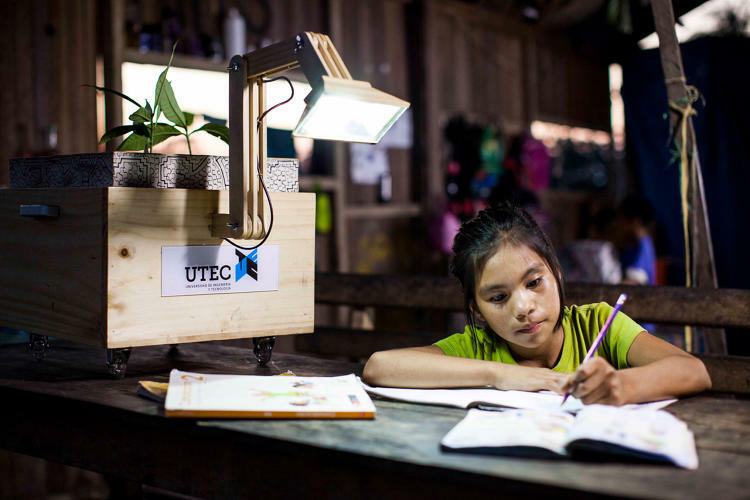 Thankfully, some University researchers and students have come up with an ingenious solution: a plant-powered light.